We are specialist in the professional design install and maintenance of imprinted concrete driveways, paths and patios. Imprinted Concrete, quick to install, long lasting, minimal maintenance the low cost alternative to other methods of paving. Create your own unique design. Choose the look, style and colour you want that matches your home and garden. See samples of our patterned imprinted concrete driveways and patios in households all over Dublin. Find out more about getting a low maintenance imprinted concrete driveway, path or patio. Imprinted, patterned and coloured concrete is a modern, low maintenance cost effective solution's for large or small areas that need to be paved. It is unique from standard concrete and paving slabs because you can design the look and style you want to suit your own home and it is guaranteed to be long lasting and very low maintenance. Selecting the right driveway, paths and patios around your home is a very important decision as it is a long term investment that can add value to your property. That's why imprinted concrete is ideal for your home improvement project as it delivers a custom made, fast and affordable paving solution. Imprinted patterned concrete is made when newly poured ready mixed concrete is stamped with a patterned mat to give the effect of cobblestone, tiles, brick, stone or slate. During the procedure a colouring agent is added and then it is finished with a High Gloss or Matt sealant to give a beautiful natural look. Imprinted Concrete is quick to install, long lasting, minimal maintenance and a low cost alternative to other methods of paving. But perhaps the most unique thing about imprinted concrete is that you can create the look, style and colour you want that matches your home and garden. At GMcrete we manage the project from start to finish from design to installation. You can be assured of a quality proven product professionally installed. We ensure all the drainage is well planned and installed including arc drains and manhole covers, we provide building services if you want to enlarge your driveway entrance, add new pillars and raised flower beds and build new or replace boundary walls. ► Resealing and maintenance service to existing surfaces laid with pattern imprinted concrete. The beauty of working with imprinted concrete is that it offers such a wide choice of patterns colours and designs for you to choose from to match and enhance the appearance of your home or business premises. Our extensive portfolio of products allows you multiple options to choose from so why not visit our Your Design page to see how you can design your own driveway, path or patio. You may also want to look at our Our Work page to get some inspiration for your own designs. 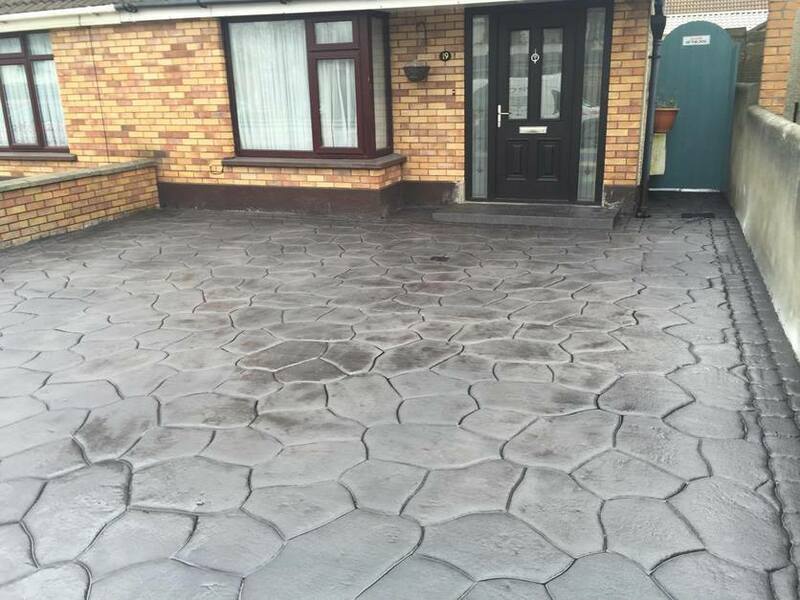 Glenn Murphy, one of the most experienced printed concrete experts in Ireland, established GMcrete Patterned Imprinted Concrete to offer a first class professional service in coloured printed concrete driveways and patios to households and businesses throughout County Dublin. Glenn Murphy, has been in the trade for over 27 years and his experience and expertise is unrivalled and greatly appreciated by his many happy customers. To find out more contact GMcrete now for expert advice, a professional service and very competitive pricing.